I forgot to post our annual card here! My resolution for this year will be to get back to posting more on kokochi.com! Today was a beautiful day. 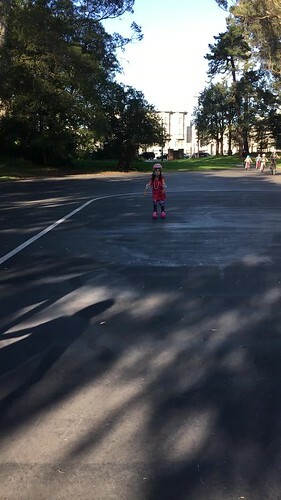 I packed up our bikes (Aila rides attached behind me) and we went to Golden Gate Park. We rode and explored with Tesla as the lead. Stopped at Stow Lake to paddle boat around while we ate ice cream. Aila just got cheapo roller skates that she brought, so we stopped at the skating area in GG Park. Tesla patiently waited, and when I joined Tesla on the bench because Aila wanted to skate on her own w/o mama's help, a super pro skater later approached Aila and gave some lessons! Golden Gate rejuvenates. When we came home, Aila still wanted to skate so we opened the garage. Then Dav came home and they played hockey. I started taking lessons on how to put on a kimono with the goal of being able to put it on properly by myself. There are various levels I can try to achieve, but I'm focusing on the simplest obi tie that will take months to learn, and I'm not even planning on delving into the dos and don'ts for each season (color, cloth make, obi match etc). First lesson was going over all the stuff we need, and how to properly fold kimono back for storage. My amazing mom handed off a lot of things to me this past summer, and now I know what a valuable gift it is. I have what is needed but I've learned from my kimono teacher that very recent kimono tools make it easier, so I'm about to ask my mom to send me that stuff that utilizes velcro, stretchy bands, and other hidden tricks. Now, I can't imagine back in the day putting on formal kimono by oneself without the modern shortcuts. I simply never knew the layers and layers involved in getting properly dressed. I've worn kimono before but was either helped by someone, or utterly misdressed myself. Luckily I have a fellow student (another mama at Rosa Parks Elementary, Ikuko-san) to share laughter at how one ideally needs to have amazing arm strength and flexibility to put oneself in a kimono, mainly to tie the obi. If assisted it's much easier. By the end of today's lesson, Ikuko-san and I were rather exhausted. We couldn't fathom how women then went on to a formal tea ceremony that lasts for hours, and if in the city, requires riding a train, but you can't sit back because of the beautiful obi you sweated over to get right and don't want to smush. And we're doing the casual "living in America" version - meaning we can break rules. I'm thrilled at the depth there is to learn. And so grateful to my mom who shared this, and was happy to hand over her gems to me. I hope if I can actually learn the rules, and my kids see me dress and wear it out more often (which is my goal), then somewhere, later, they will feel a connection. I do feel very happy feeling snug in a kimono, a bit like a corset. Kids asleep, I'm watching a TV show. Tonight I learned that Tokyo station Shinkansen/bullet train area manages crowd control by ekiben - those lovely gourmet bentos that are meant to be consumed on the train as you watch the scenery go by. Normally, one would never eat/drink on a train so these ekiben are coveted. Just like everyone else, I look forward to riding the Shinkansen for the opportunity to eat these beautiful meals. Crowd control happens because people getting off the shinkansen from outside of Tokyo need time to figure where they need to go so stop to look around, thus interrupting the flow of people. Tokyoites walk fast (even some escalators go faster than regular ones to keep the flow, and everyone knows if you aren't going to walk up the escalator, you must stay to the left to let the others rush by). Those getting off the Shinkansen and those heading to get on were clashing. So close to 10 years ago, Tokyo station put ekiben sellers one floor downstairs, encouraging a significant flow of those heading out of Tokyo to go via the basement. They'd get their ekiben, head to their train via another route, and not be in the area of the newly arrived folks. p.s. It's been long enough since I've lived here, and Tokyo train stations have changed so much with new lines, new connections, new station layouts that yes, I'm one of those who stops to look for signs, and at times have to ask where I need to go when I used to know everywhere. Sigh...weird to be the tourist. We left SF at 1:35am, arrived in Tokyo 4:45am next day JST, a flight schedule I've never taken so I wasn't sure how to work through the jet-lag. Back when I came for work, I used a different flight and knew when to push through or allow a nap to quickly get over jet lag, but this time it took a few days. One afternoon, Tesla and I napped at 3pm, skipped dinner, and ended up sleeping all night while Aila played dress up with my mom, and finally crashed around 7. In between, we managed to start doing stuff. We took a train to Yokohama Landmark Tower to see some views. On the way, Aila's foot got caught between the train and platform. The train conductor asked if we needed a bandaid but I said we were fine. But by the time we got to the station exit, the station master had apparently heard about this and had train branded bandaids ready. Aila was pleased to bits. Yokohama view from the tower: Yokohama is more laid back and spacious than Tokyo, but still a big city. In the 2nd pic you can barely make out the buildings of central Tokyo on the horizon. The city goes on forever. Friday night my parents babysat so I got to meet Mieko-san at a fancy restaurant. They are famous for tamago gohan (rice with raw egg) and shaved truffle! At a restaurant we went to that offered a gift to kids: Aila chose a plastic necklace and giant matching earrings. Once Aila went to bed last night, I introduced an old game to Tesla that would be too complicated for Aila. Mille Bornes. I grew up with that game. And my opponent? My dear brother Ian. Ian and I yelled "Coup-forre" to each other many a times. Love my brother. Aila said she wanted bangs because her teacher at preschool has bangs, and she didn't want to wear pins to keep her hair away from her face. She is delighted! Such a new look for her. Every Wed. for almost a year, we've been at Pacifica for Tesla's horse riding lessons. Tesla loves horses. And when I look back, she was always crazy for horses. I didn't piece it together until horse-loving folks told me, "either you have it or you don't." Apparently, Tesla has it. I mean Chocolate, Tesla's fav horse stuffy (that I tried to get rid of since it was so big), made it into a family portrait years back. Chocolate still sits on her bed. Now, Tesla cleans stalls (poop), cleans horse shoes (make horse pick their hoof up to get picked at), brushes them, and rides them. When her teacher pushes her with strict detailed instructions, Tesla follows. A slight shift of weight, tug of the reign, or not properly holding in reigns makes a huge difference. So seeing Tesla guide her horse in a specific way, over logs, around barrels...well, I am impressed. The horse would wander if the rider isn't in control. Last Wed, Tesla's horse got spooked. Hanging out with horses over this year, I get it. They are chicken about any sound or movement, imagined or not. When walking around them, you are supposed to constantly touch them so they don't get surprised, as in, "I'm here, and here, and walking around you here." Otherwise they might kick you. I saw Tesla's fall happen. Lucy, her horse, bucked, and Tesla hung on as if to a bucking bull. It seemed like she was calculating the best time to fall off/be thrown off. She was calm as a cucumber. I've been on a few horses (before Tesla took lessons and I paid occasionally for touristy rides at her plead), and felt a few jolts...each time it was scary for me because you don't know what this giant animal will do. Luckily, she's ok. Her ankle hurts, but not sprained She's resting at home for a few days. This is a part of being a cowgirl. I showed her today a picture of her great-grandmother riding a horse with my dad on the saddle. She was an accomplished rider and horse lover. I never met her as she passed in childbirth with my uncle. I can't imagine how hard it was for my dad and uncle. I like to believe that through Tesla, she passed on this horse love. We never encouraged Tesla, but here is her passion. And I love it as I feel & see a connection with this amazing woman. One reason Dav and I get along is both of us are rather ok about not doing much on holidays or bdays so that there is no pressure if we forget (altho anything that involves kids, I'm on it!). In exchange we do random things when it feels natural. But sometimes, it is nice when things align, and holidays are celebrated with ease. I love oysters and today we got to go to Hog Island Oyster Co. in Marshall thanks to Dav's colleague who made a reservation. Then we went to Stinson Beach. Aila brought home a lot of rocks.